User permissions in Pimcore are based on a users and roles concept. Each user can have serveral roles and both - users and roles - can have permissions. Users and roles are configured in Pimcore backend UI at Settings > Users & Roles > Users and Settings > Users & Roles > Roles. In Pimcore there are two levels of user permissions. Firstly, the permissions on system components and secondly permissions on data elements (assets, objects and documents). Permissions can be granted to roles or individual users. The following paragraphs describe how and where permissions can be set and how they will or will not affect each other. It is not mandatory to use roles, permissions can be granted to users directly. However, it is advised to use roles if there is a larger user group to manage. In the user/role settings tab it can be decided which permissions are granted to that user or role. An individual user has a few more general settings than the role. A user will be granted any system permission that is granted to them directly or to any role they incorporate. A permission granted to a role incorporated by an individual user, can not be rescinded for that individual user. So it does not matter if the checkbox in the user's individual permissions settings is unchecked once a permission is granted through a role. Beyond the permissions mentioned above, a user's access can be restricted on element basis. This can be done by defining workspaces for a user or role. Provided that a user may generally access documents, it can be specified what a user / role may do or not do with each document or workspace. The same is true for objects and assets. These settings are manipulated in the "Workspaces" tab of a user / role. A user needs to be granted access to one or more workspaces. The user can not access any resources outside of his workspace(s). An individual user is granted access to all defined workspaces for any role they incorporate. In addition to that, users can have their own workspaces. These are added to the permissions granted by roles. For example, a role myRole has been granted list and view access to /home/myPath. The user editor incorporates the role myRole and thereby inherits all workspace settings from the role. In case the editor has his own workspace settings on /home/myPath, these permissions are added to permissions from any role they incorporate. A permission granted by any role can not be rescinded for a single user. It is also possible to restrict access to localized fields on a language-level. By default, a user can view and edit (as long as they also have sufficient object permissions) all localized fields. This can now be restricted to a subset of languages. The configuration panel is accessible via the Special Settings column. 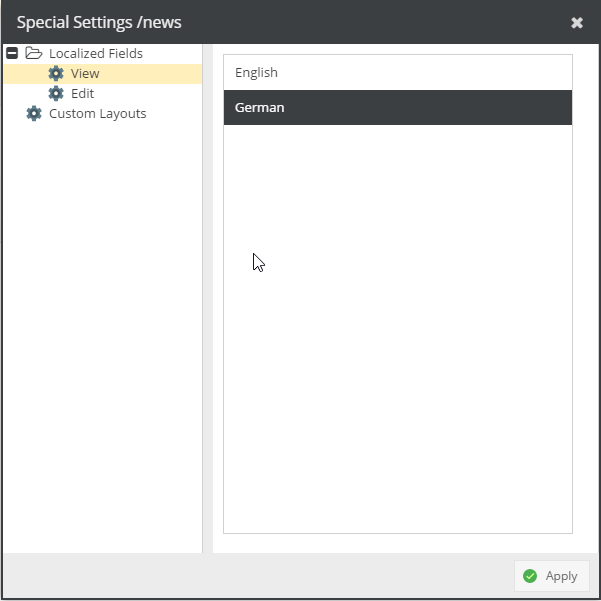 The same dialog also allows to specify available custom layouts for the user.